MTSU welcomes national NAACP p..
MTSU’s School of Agribusiness and Agriscience celebrated the grand opening of the new $4.3 million dairy and dedication of the MTSU Experiential Learning and Research Center on Sept. 15. The farm and new dairy are located from 3001 to 3211 Guy James Road in Lascassas, about six miles east of campus. The campus community and general public were invited to attend. 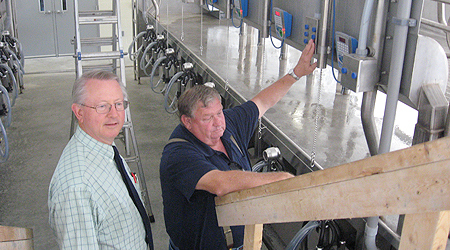 the ribbon-cutting ceremony, followed by a tour of the dairy’s milking parlor and other farm facilities. The dairy’s features include a double-eight parallel milking parlor with rapid-exit gates that can milk 16 cows at a time and a computer-controlled milking system with individual cow-ID and cow-activity measurements, along with real-time milk weights and milk-quality measurements. The milking system includes an in-line heat exchanger to precool the milk to 58 degrees before it enters a 2,000-gallon bulk tank, where it will be cooled again to 38 degrees. The University’s dairy herd was later transferred overnight to their new home. You can watch a slideshow of the events here.